Angels have long captivated us. In our communities, cultures, and storytelling heritage, angels have played a profound role in illustrating meaning and purpose. When you give the gift of an angel to someone, you’re sending a message that holds the weight of so many things angels can represent. A Willow Tree angel can be an eloquent gift that says all the things you wish you could say when someone you care about needs reassurance and comfort. If someone you love has lost someone dear, giving the gift of an angel can be a way to offer comfort in a time of grief. Having a figurine to represent the person who has passed as a guardian angel can be a much needed reminder that the love shared still remains. Angels often represent wisdom and guidance, so giving the gift of one can say “Someone is watching over you.” during a time of great challenge. The fear of the unknown can be soothed with the reminder that you are not alone. If someone you know is experiencing a difficult time in his or her life – an illness, a crisis at home, a stressful change at work – sending a Willow Tree angel can give reassurance and comfort when things feel out of control. Angels symbolize protection and delivering a message. Saying to someone, “You’re going to be okay” can sometimes be the most powerful and important thing in a time of struggle. 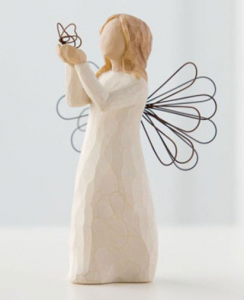 For these messages, and more, let us help you send a thoughtful and appropriate gift to someone you care about with our selection of Willow Tree angels.